Blog on Your Windows Mobile! MoBlog is a dedicated Windows Mobile blogging application, available as freeware. Requiring the .NETCF 2.0 framework pre-installed on your device (available free from Microsoft), there are versions available for both Windows Mobile Smartphone (351kb) and Pocket PC (347kb) devices. Enabling you to blog on the go with internet access to your preferred blogging platform, moBlog represents a massive advantage to bloggers who bemoan the fact that they are tied to desktop PCs and laptops. Available from sampath.wordpress.com/moblog, this is a freeware tool that can be used on Pocket PC and Smartphone varieties of Windows Mobile, and requires Microsoft .NET Compact Framework 2.0 to run. Installation is straightforward, requiring a quick download via your mobile connection or desktop PC. There is no Windows Installer package, so the downloaded CAB file will need to be copied into a suitable location on your synchronised mobile device. 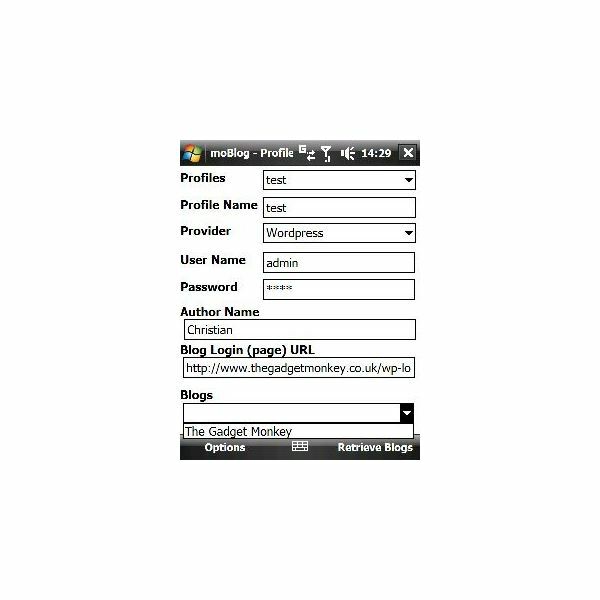 Most bloggers utilise either a hosted page (Blogger.com or WordPress.com) or host a blog on their own webspace (typically utilising the WordPress system). MoBlog supports posting to blogs on any of these platforms, as well as Windows LiveSpaces. If you own multiple blogs, or even multiple blogs across different platforms, moBlog will allow posting to any of these, thanks to the use of different profiles within the software. Setting up moBlog for use with your blog is simple, requiring just your usual username and password, and the URL for the login page you would use when publishing on your desktop PC. Once setup, blogging via moBlog is simple and straightforward. The options are basic, however, with no facility to create new categories; however you can assign relevant tags. Text can be formatted as bold, italic and underlined type, while images stored on your Windows Mobile device can be uploaded for inclusion within your blog post. 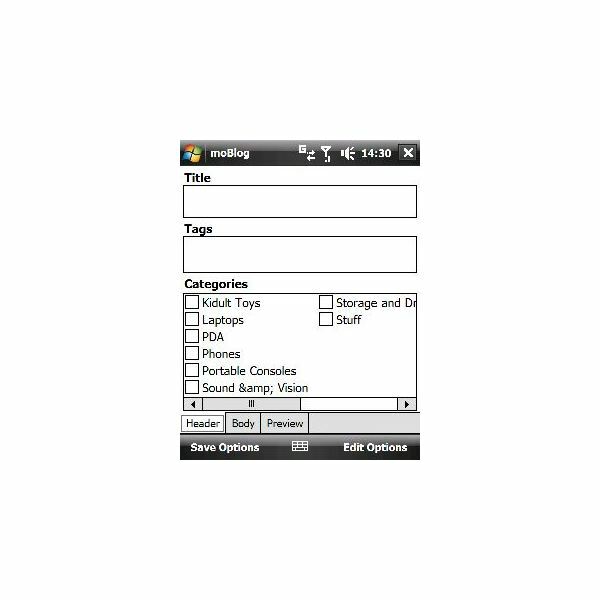 The current release of the software was issued before the current proliferation of Windows Mobile 6.1 devices, and as such entering text into the blog post requires the virtual keyboard to be opened and closed as there is no facility to scroll through the window with the keyboard active. This is of course a bit of a let down, and could be forgiven if not for the absence of one other vital component. Inexplicably, moBlog doesn’t support cut/paste. Any blogger wishing to compose their post in Mobile Word or copy something from their browser and into the blog are unfortunately unable to do this; moBlog has no Edit > Paste and no stylus menu. I find this a stunning omission, leaving the software useful only to those bloggers that often publish 100% of their own content and those that might be familiar with the iPhone. One smaller gripe is the inability to set the date and time of the post. Often servers are situated in different timezones to the poster, and while this is an inconvenience easily overcome using a desktop blogging solution, posting via moBlog results in a few posts being marked as “Scheduled” in WordPress. Sadly, moBlog is no longer being developed, which means that these problems are unlikely to be resolved. However, these problems do not render the software completely unusable.